In the modern technical era that we live in, computers and electronics appeal to a wide array of customer segments. Best Buy has capitalized on this diversity with their ‘My Best Buy’ rewards program by offering four different ways for their customers to save money, meanwhile using some clever techniques to encourage rewards members to utilize the Best Buy mobile app. This is the base level membership offered for free to anyone who wants to join and has no minimum spending requirements. Perks include: 1 point earned for every $1 dollar spent (250 points = $5 reward certificate); Free standard shipping on any order $25 or more; Returns and exchanges within 15 days; Access to special sales and events. The Elite program is for customers who have spent a minimum of $1500 in purchases and includes even better perks such as: 10% point bonus so every dollar spent is worth more; Free standard shipping on any order; Returns and exchanges within 30 days; Even greater access to special sales and events such as Black Friday; The added feature of a points bank that allows customers to accumulate their points and use them when they choose. The spending requirement to be in the Elite Plus program is a minimum of $3500 in purchases and include even greater benefits like: 25% point bonus on every dollar spent; Free expedited shipping on any order; Returns and exchanges within 45 days; The same features as the Elite program with regards to special sales and events and the point bank feature. Video game lovers have 10 ways to save money and earn points. Some of the standout features include: 20% off new video game software for 2 years; 2x the points on new video game software, digital content, and game accessories; 2x the points for every dollar earned for game trade-ins; 10% off pre-owned games. Regardless of which program a customer chooses, Best Buy encourages the use of their mobile app by offering bonus points when a customer checks in with the Best Buy app and also encourages mobile use by offering special promotions that can only be accessed through the mobile app. Best buy has found a very smart way to incentivize customers to use the mobile app technology while giving customers even more rewards. Best Buy understands that one size does not fit all and has offered multiple ways for a diverse customer population to save. 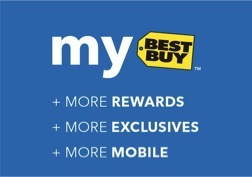 To learn more about the My Best Buy rewards programs you can visit their website.